CenterPoint partners with F.I.S.H. (Friends In Service Helping) to provide free food to our community. 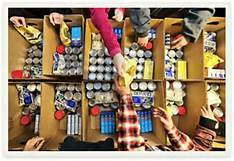 Every second Saturday of each month, the food is distributed at CenterPoint, providing both perishable and non-perishable food items for those in need.